Southern food (soul food or whatever you'd like to call it) was the fad of the moment a few years ago with an array of restaurants in the Bay Area doing it to one degree or another with varying measures of success. Back in 1999 though, it became the goal of one Tony Hua to open a place that served up delicious homestyle soul food. 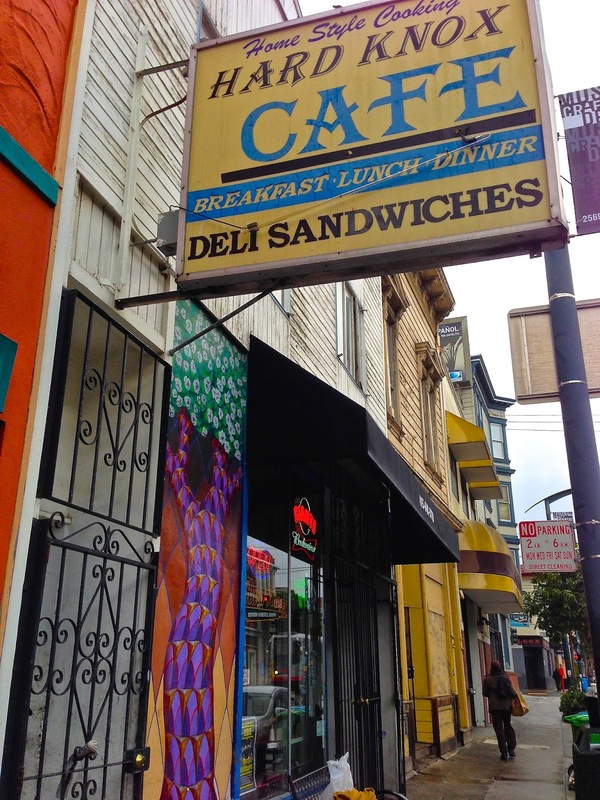 He realized that dream with the opening of Hard Knox Cafe in what at the time was a little known SF hood called Dogpatch. These days, Dogpatch is happening with UCSF, tech start-ups, new condo construction, Third Street Rail and the future home of the Golden State Warriors at 16th and Third St. But the restaurant was a success long before that and even spawned an location out in the Richmond District. I've been going for many years to eat there and considered it one of my hidden out of the way faves. Sadly, particularly when there is a baseball game, the place can be mobbed. Still, during the week it's relatively easy to get in or get take out. I figured I might as well review the place for those few folks who don't already know what they may be missing. It's not a big place, thus it gets full quick, so either go early, closer to closing or order it to go. Recently I took the opportunity to try the pick-up route over several visits to see if the food is the same as eating in. Herewith, a journey in 4 to-go containers. Fried shrimp po-boy with lettuce, tomato, house made remoulade sauce served on a french roll. 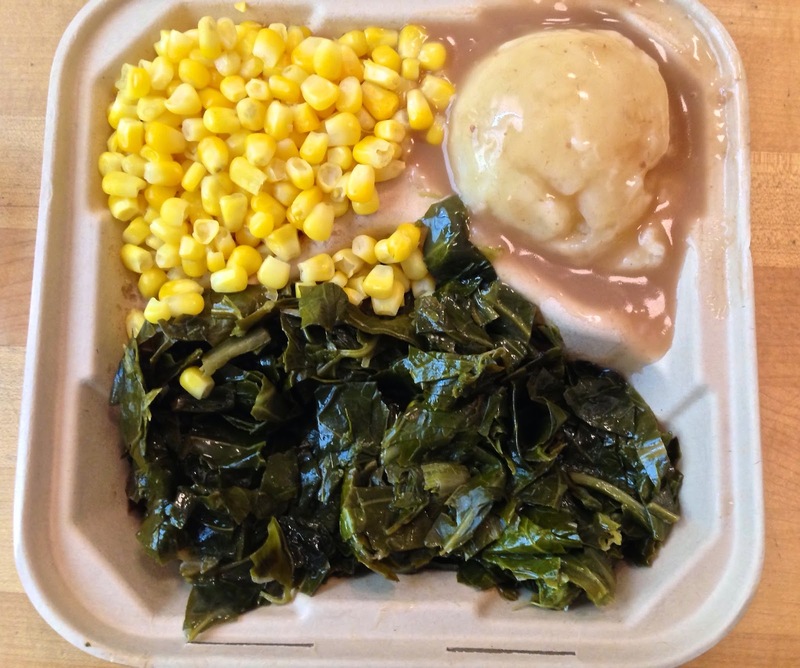 You get a choice of any 1 of their sides and here I got collard greens. All for $8.50--yes, you read that right, a big sandwich PLUS a side all for LESS than $10. Take note you other SF sandwich places, you don't need to charge a lot to make good food. This is a tasty sandwich. Large tiger prawns are cornmeal battered, fried and served up fresh on the bun. The remoulade is equal parts spicy and sweet to balance flavors without overpowering the shrimp of which you get more than enough to have one in every bite. I would say you should even get a side of the sauce for dipping. I do wish the bun was toasted a bit more, but that is a minor quibble. For me, they also make some of the best greens in town. Soft, with just a little crunch, nicely seasoned and cooked in bacon--small bits pop up here and there. You get a hefty portion, which is great for healthy eating. Adding in a dash of pepper and a splash of white vinegar make these the perfect side dish. The house made pulled pork shoulder on toasted sourdough bun with cole slaw and a side of mac and cheese--for $8.50. The mac and cheese is good. Hearty, cheesy, creamy and kind a childhood memory flashback to the Kraft stuff, only better. And again with the hearty portion. The pulled pork, however, is a big miss-step to me. While the meat is tender, it is covered in an overly sweet barbecue sauce that hides any flavor the meat would have. It's thick, gloppy and made my teeth ache. The slaw also was no help. Way too much mayo and on the sweet side also. Combining these together creates just one big sweet soggy mess I found unappealing. There are too many other places in this town doing tasty pulled pork, my suggestion is skip this one and order something else on the menu. Catfish po-boy with lettuce, tomato, remoulade sauce on toasted french roll with side or red beans and rice--$8.50--it's a good price point. The catfish is also offered in an entree portion size but I didn't quite that much so went for the sandwich version here. I'm a fan of catfish and few places in town do it, or do it well. Here you get a generous portion of light flaky fish, cornmeal battered and fried. It's all made to order so you get the fish hot and crispy and I liked it a lot. Again the sauce doesn't overpower the fish and you can taste all in equal harmony. Another large side dish portion of red beans and rice. It's more beans ladled over the top of rice but ultimately is the same concept. I liked them though thought they could use a bit more seasoning or kick if they wanted to be traditional Southern soul versions. I sprinkled a little bit of the hot sauce packets you get with the take out and it help elevate them, so getting a few was worth it. Let's you think this place is all meat all the time, they do offer up a veggie plate for $8 that includes any 3 of their sides plus 2 cornbread muffins. I dove in one day with cut corn, mash potatoes and gravy, the collards (again) and the cornbread. The corn did tasted fresh and crisp. The mashed potatoes are homemade with little chunks of potato. The gravy was peppery thick brown meat version of which you get plenty. I do think they under season things just a tad. I usually end up adding a dash of salt, pepper and butter, but a lot of that is personal taste thing and I'm guessing they want to keep things as simple for folks to dress up or down as needed. 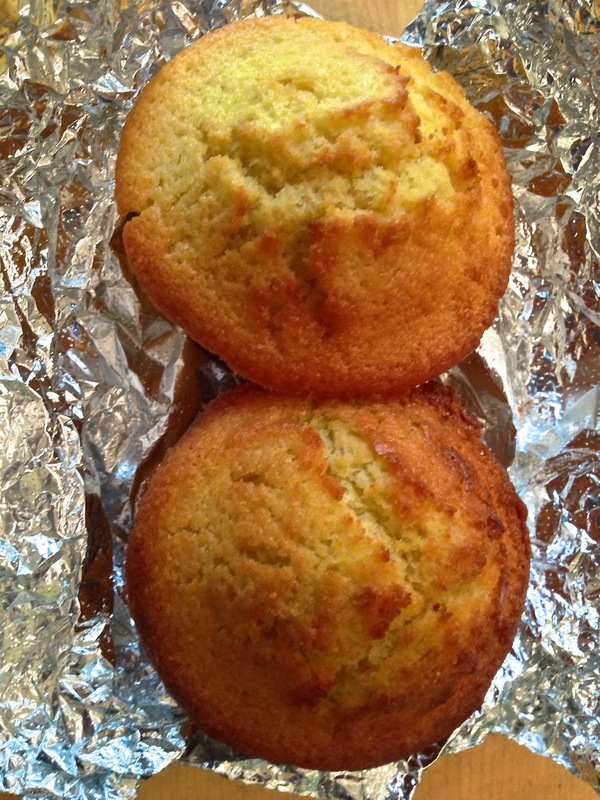 The cornbread muffins are served piping hot so the pats of butter will easily melt into the center of the bread. I like the muffins. Simple, straight up cornbread, no fancy fillers needed. Not too sweet or dry, they are the perfect complement to the collards and other sides you can get. Over the years I've had other things here, fried chicken, waffles, country fried steak, etc. And for the most part I like the majority of what they do. Food has been consistent and good (except for that pork mess) and prices have remained steady and affordable over the year--something that can be difficult to find in San Francisco. Needless to say, if you are looking for some down home food, it's worth the trip out to Dogpatch to check out Hard Knox Cafe. Though I might suggest a nice bike ride as opposed to actually having to ride the T-Line (consistently late and unpleasant to be on). That way if it's busy you can just get it to go and ride down to Heron's Head Park for a lovely picnic and great views of The Bay. Either way you win.